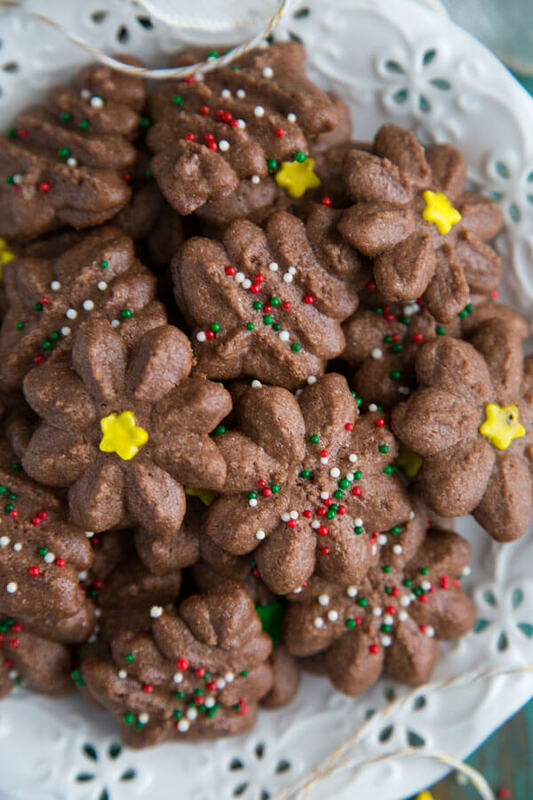 This Chocolate Spritz Cookie recipe is one of the easiest holiday cookie recipe you’ll find. 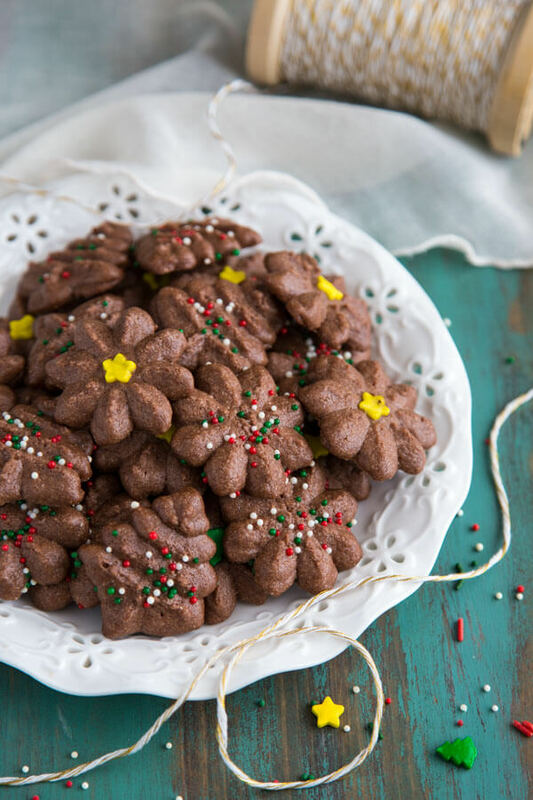 These bite size chocolate spritz cookies are adorned with holiday sprinkles for a festive look. 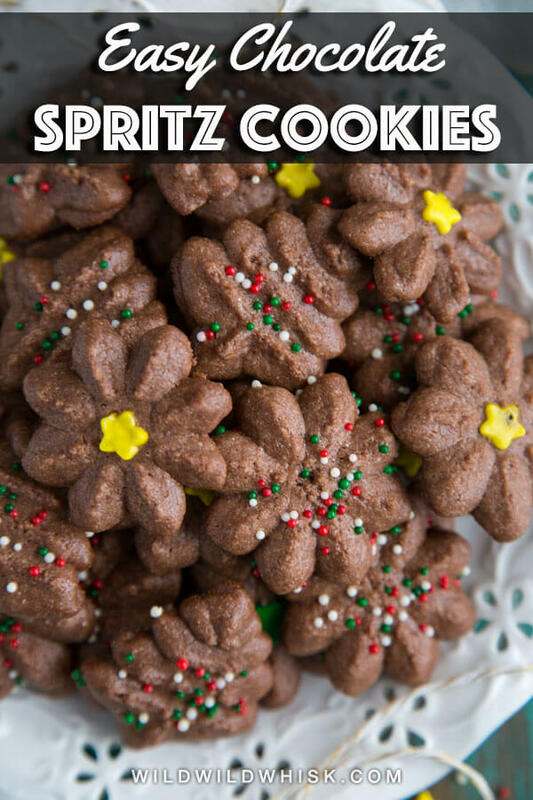 One batch of this spritz recipe makes over 3 dozen cookies, more than enough to pass around the office and to share with your neighbors this holiday season. This spritz recipe is made with simple ingredients that you won’t have trouble finding. It starts with 1 stick of soften unsalted butter, creamed with sugar until light and fluffy. Add an egg yolk and vanilla extract to complete the preparation for the wet ingredients. As for the dry ingredients, I never sift my flour or cocoa powder. But I always add them to a separate bowl and mix them up with a small hand whisk to distribute evenly as well as to break up any large lumps that may be present. Add this to the wet ingredients with the mixer on low speed, and mix until a soft dough forms. Press the cookies onto prepared baking sheets right away. Over the course of the last couple weeks, I’ve tested dozens upon dozens of spritz cookies. I baked them on buttered baking sheet, parchment paper and silicone mat. Silicone baking mat – I found the silicone mat to be the best when it comes to getting the cookie dough to stick to it when pressed. 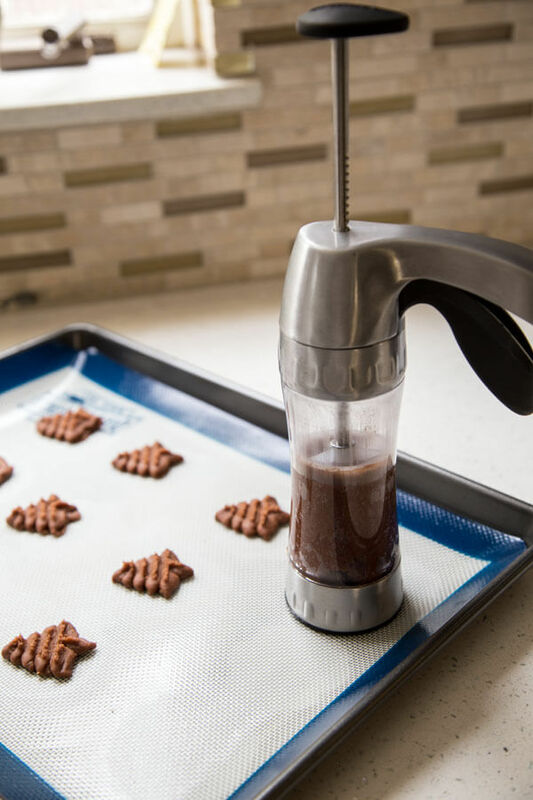 The cookie press base is also lined with silicone so when you place it on the silicone mat it doesn’t move, which make pressing the cookie dough out much easier. Parchment paper – it does a good job, but it’s light enough that once in a while when you lift the cookie press, the parchment paper along with the cookie dough will lift with it. This happens more frequently if the cookie dough is chilled before being pressed. It is best to press the cookie dough right away. Buttered baking sheet – don’t even do it, the cookie press will slide all over the place and the cookies will still stick to the cookie sheets after baking. Another thing I love about these cute chocolate spritz cookies is that they are not too sweet, which means they make great snacks any time of the day. They are adorable with festive sprinkles and will make great edible gifts for the holidays too. These three dozens cookies were gone within 3 days. 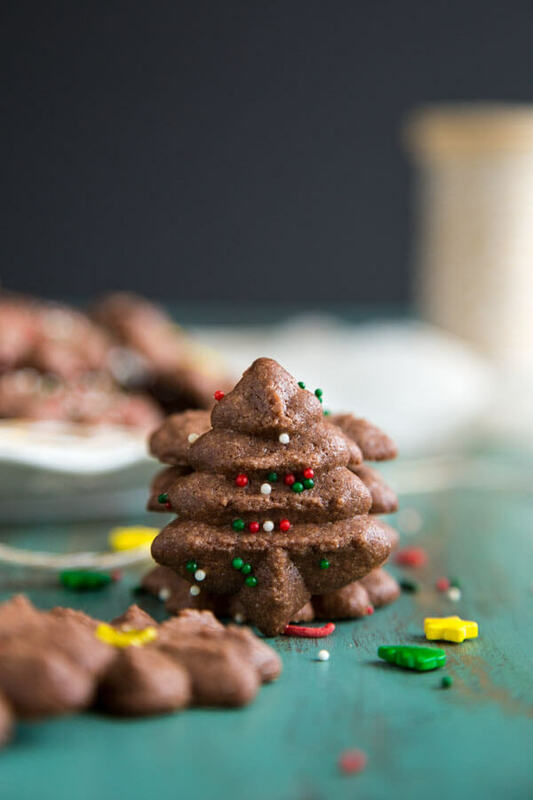 So get your bake on and make this chocolate spritz cookie recipe now! If you make this recipe, please let me know! Leave a comment, rate it and don’t forget to tag me @wildwildwhisk on Instagram. I’d love to see what’s cooking up in your kitchen. Cheers! 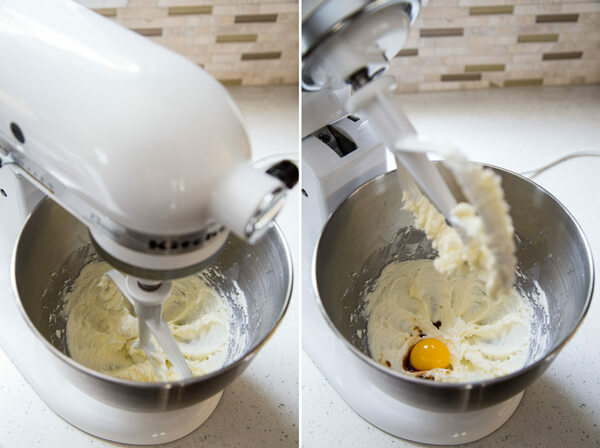 Cream soften butter and sugar in a mixing bowl with the whisk attachment until light and fluffy. Add egg yolk and vanilla extract and beat until combined. Add flour, cocoa powder, baking powder and salt to a small bowl and mix to distribute evenly. 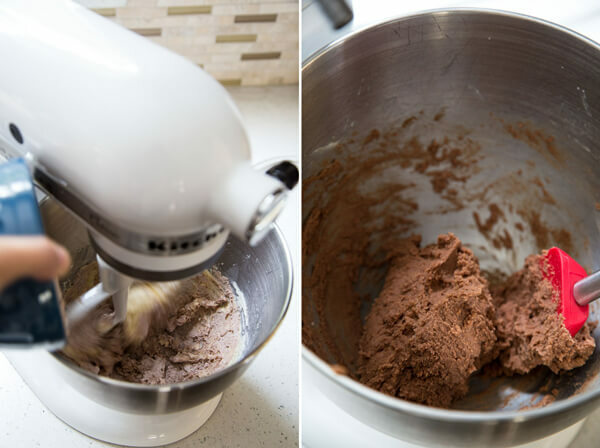 With the mixer on the lowest speed, slowly add the flour mixture to the stand mixer bowl and mix until thoroughly combined. The dough should be soft and easy to handle. Fill the cookie press with the cookie dough and line three baking sheets with silicone baking mats or parchment paper. Hold the cookie press perpendicular to the prepared baking sheet and press out the cookies, spacing about 1 - 2 inches apart. 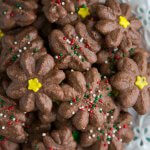 Add sprinkles, color sugars or any decorative touches desired to your cookies. Chill in the fridge or freezer while the oven preheats. Preheat oven to 375°F. Bake for 8 – 9 minutes. Remove from the oven, let cookies cool on the baking sheet for 5 - 10 minutes before transferring to a wire rack to completely cool. I recommend silicone baking mats for this recipe but parchment paper will also work if you don’t own any silicone baking mat. Some of the links above are affiliate links, which pay me a small commission for my referral at no extra cost to you! Thank you for supporting my blog. Good, and not too sweet/ I used 3 T of cocoa and added 1/2 t of espresso powder. Thank you for the feedback! Espresso powder is a wonderful addition.